We are all familiar with them. We have all encountered them on our journey. Obstacles. Roadblocks. Here we are, happily going on our way. We have carefully made our plans, and we are filled with so much enthusiasm and excitement, but suddenly we are faced with so many obstacles, that our best laid plans are completely derailed. We are so overwhelmed by the problems facing us that we find ourselves drained of energy and we feel like giving up. The obstacles seem insurmountable. Every way we turn, we encounter a problem or negativity. Our plans seem doomed for failure. Yet, although it seems as if giving up is the only answer, the real truth is actually that we always, ALWAYS have a choice. We can choose to give up, we can choose to listen to the naysayers, we can choose to surrender our dreams and plans. We can choose to use the problems and obstacles as a very good excuse to give up. Or we can choose to take a fresh look at the obstacles presented to us. Yes, obstacles can stop us in our tracks, they can bar the way. However, my brother taught me that obstacles are merely stepping stones on the way to the future. 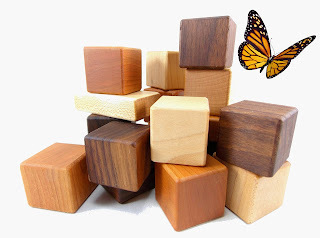 Obstacles are very useful building blocks for our journey. He taught me that they are there to teach us perseverance and creative thinking. They strengthen us. Firstly, whenever we are faced with obstacles, it is important to NEVER GIVE UP!!! Never surrender your dreams. Instead, change your attitude from feeling defeated into one of defiance. There is always a way. When we are faced with obstacles, it is very important to take a good look at them and to evaluate them. What is this problem trying to tell you? What is it trying to teach you or warn you about? Look at all the options and then think about all the possible solutions for it. Think creatively. Maybe it is necessary to approach it from a different angle, maybe view it from a different perspective. I want to say it again: NEVER GIVE UP! Never use the stumbling block as an excuse to give up, use it as a stepping stone to where you want to be. Very often we give up when we encounter a problem, not necessarily because the problem is so big, but because we are actually afraid. We are afraid of change, and we are deathly afraid of failure. We use the problem as an excuse in order to avoid facing the real issue: fear. To be successful means to relinquish our fears and to take action. Yes, often success means we have to change. We have to change the way we normally do things, we have to change the way we live and maybe even where we live. Once we understand that change is inevitable, we will be ready for the next step. Fear of failure is a strong demotivator, yet the only failure lies in not trying in the first place. Another obstacle we sometimes encounter is our own feelings of inadequacies and unworthiness. We feel ill equipped to pursue our dreams and execute our plans. We believe we are unworthy of success and we sabotage ourselves. We demand absolute perfection from ourselves and when we cannot deliver, we consider ourselves unworthy. This leads to disillusion and feelings of depression. When we are faced with obstacles, it is important to keep calm and stay positive. Keep it simple and focus on the actual problem and not the imagined complications. Be sure in the knowledge that there is always a way to solve it, it is just a matter of finding it. Have faith and take action. Sometimes we are surprised that we not only find a way to climb past the road blocks, but we actually discover we have wings to fly right over them.